Scoop the rock melon into balls using melon baller or small spoon. Reserve them in the fridge. Add fresh milk, evaporated milk, salt, and sugar into a saucepan. Heat the saucepan over low heat, then add pandan leaf. Heat for 5 mins and while stirring. Allow to cool before placing in the fridge to cool completely. 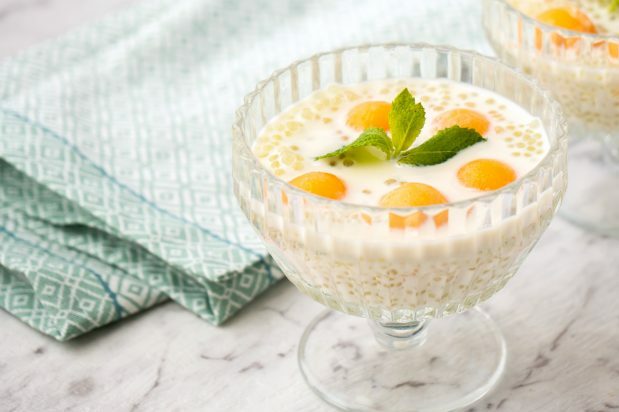 Boil a pot of water and add a cup of pandan tapioca sago after the water boils. When sago has boiled and is well cooked, turn off the heat and sieve sago out from the pot using a fine strainer. Run boiled sago through cold water. Then transfer to a bowl filled with cold water for approximately 5-8 mins. Put sago into the serving glass or bowl. Add the crushed ice (optional) and pour the prepared milk. Add the rock melon balls on top. Garnish with mint leaves (optional). Serve.